Chad, I would love your opinion on a knife question. I will be giving a chef’s knife as a gift. The recipient has worked in professional kitchens, mostly on the pastry side. She loved my Ryusen Blazen, but prefers German knives for their durability. One key requirement – she needs to chop up huge blocks of chocolate with the knife. 1) Would you recommend a German or a Japanese knife? Thanks so much, and good luck with the tome – I will be boosting your Amazon ranking shortly. If she liked your Blazen, it would certainly be sturdy enough for her purposes. If she's after sturdy but likes the German style knives for their heft and chunkiness, the Messermeister Meridian Elites are hard to beat. Similar (if not identical) steel to Wusthofs but with more comfortable handles, partial bolsters for ease of sharpening and some of the best factory edges I've seen. I spent a long afternoon peering through a high powered microscope at a wide variety of factory edges. The Messermeisters won, hands down. A good 10" Messermeister Meridian Elite would be an excellent choice. Dave, thanks for such a thoughtful review and critique. Project, thanks for your insights as well. I'm out of town for the evening. I'm taping a regional cooking show in the morning and my Internet connection is a little sporadic. I'll be back with more detailed responses tomorrow evening. 1. How can you tell if a knife is stamped or forged? Would you say most "commercial" brands (Mac, Shun, Misono, etc) are stamped, nowadays? 2. Would you say "screaming edge" is your favorite knife phrase? Actually I make a distinction between stamped knives and machined knives. Stamped knives, like the cheap Mundials, Dexter Russells and even the very fine Forschner/Victorinox knives available at restaurant supplies, are indeed punched, cookie cutter-like, out of sheets of steel, given a simple edge and put on the shelf. Modern knives like the Macs, Shuns, Misonos, et al, are machined. They are precision ground from billets of high quality steel, a process that custom knife makers call "stock removal." You also have to remember that Euro-style knives like Henckels and Wusthofs aren't forged in the way we commonly think of forging. There is no burly Teutonic artisan lovingly whacking a glowing bar of iron into your chef's knife. It's a single bonk from a 20 ton drop forge or a slow squeeze in an electric compression forge, neither of which imparts all of the qualities usually associated with hand forging. The "forged versus stamped" argument is out the window with high quality knives these days. Hmmm, I do use "screaming edge" a lot, don't I. I'll have to watch out for that. Thanks for the response Chad! You're right, you do make a distinction between machined, stamped, and forged knives. This cutlery world is so complicated! What do you think about the knives with a single bevel? I've never used them, but I have an opportunity to get one for very little money and am tempted. I should say that I have a lot of knives (I've worked in cookware stores off and on for 10 years and thus have quite a collection), so it's not as if I need any more. But I'm tempted by the Shun Pro or Pro II lines -- should I get one? What are the advantages or disadvantages? From the HarperCollins publicity dept. I'm much too modest to post this stuff myself. Very tired. I've just come in from driving 500 miles over the last two days to tape two segments on a small regional cooking show. Not as smooth as I would have liked, but there was no major blood loss, so I count it as a win. I also got to have dinner with my parents at Devereaux's, which was just spectacular. I have to think that writing a book is a little like the process of 'birthin a baby'. So I'm curious to know how the book came about? Did you approach the publisher or did they approach you? How did you schedule your writing time? How long did it take you to get to the first draft? How painful was it to have someone look over and edit your baby? Anything you would change looking back? Hi, Kerry. I suspect you're right about birthin' a baby. Up to and including the postpartum depression, where I didn't do anything really useful for a couple of months after turning the manuscript in. After doing the eGCI Knife Maintenance and Sharpening clinic and a couple of other knife related articles (The Way of the Knife was chosen for "Best Food Writing 2004," for example) I thought there might be a related book in there somewhere. I was lackadaisically working on a book proposal when I got an email from my (now) agent, Helena Schwarz asking if I wanted to do a knife book. Twelve iterations of the proposal later, we had something she felt comfortable shopping around. On February 14, 2006, Harriet Bell, then head of HarperCollins's Morrow division made a preemptive offer on the book. Steven King once said that if you take more than a year to write a book you're just dicking around. He's right. It took me a year and half to write the book. There was a lot of dicking around involved. The manuscript was supposed to be delivered by February 2007, but wasn't turned in until June of 2007. We decided that me writing a book wasn't stressful enough, so just to make things more fun we threw in a major career upheaval for my wife and a cross country move. Parts of the book were written when it was just me in a completely empty house with a mopey yellow Labrador Retriever, sleeping in a sleeping bag because my wife, kids and all of our furniture were in North Carolina. Most of the delay, though, was my own damn fault. I overindulged my tendency toward compulsive research, meaning that when I sat down to write I had so much material that I was paralyzed. Oh yeah, a week before the intensive photo shoot for the color section of the book, I had a bad accident with a broken wine glass. Would you take knife advice from a guy with stitches in his hands? That was another delay. I'm a freelance writer anyway, so I didn't have to work around a regular day job. After a lot of napkin math and soul searching, my wife and I decided that I could stop taking other projects and just concentrate on the book. That helped a lot. She gets major karma points for essentially carrying the family for a while. I spent my days researching, taking notes and filling in the outline and structure that I used to guide my thinking. The next one will go much more smoothly now that I have a more realistic picture of what it takes. Unless, of course, your baby analogy holds true and one forgets what kind of hell it really was. The editing process was surprisingly easy. It helps that I've been a writer for a very long time. Not only do I have pretty thick skin, I've learned to craft my work so that it doesn't require a lot of editing. Gail Winston, the editor who took on my book after Harriet Bell left HarperCollins, was pretty easy going. She gave me some general direction, noted a couple of places where I let the humor go overboard and largely left the manuscript alone, trusting her instincts and my voice. I did have one temper tantrum early in the process when I'd sent her a couple of chapters that weren't quite ready for prime time. She didn't think they were nearly as humorous and informative as I did. I was mainly mad because she was right. I also helps that I asked for (demanded) Suzanne Fass as a copy editor. Suzanne is a marvel. Once the manuscript is accepted by the publisher and entered into their proprietary typesetting/publishing system (which takes weeks, by the way), the copy editor's job is to go through everything line by line, comma by comma, to make sure that it is grammatically correct, factually correct, that the photos actually illustrate what they purport to, and generally make the author's life a living hell of fact checking and persnickety 9th grade syntax. Thank God. The copy editor is the person who makes sure that if you've referred to shiro-ko in one section, that it isn't shiroko (no hyphen) a hundred pages later. How she kept track of all that stuff I'll never know, but she did and the book is much better for it. It helps considerably that Suzanne is a former chef, so she was able to check recipes for anything weird, make sure the photos showed good technique, et al. I have since recommended her to other authors working on cookbooks or food related books. That experience is invaluable. There are a lot of things I would change, mostly because of screwups or misunderstandings on my part. I can only hope that I get the chance to make new and innovative mistakes for the next one. A follow-up question. Along with the single-bevel knives I was asking about, I have the opportunity to get one of the Shun Elites, with the powdered steel. In your opinion, is it worth the extra cost? Hi, Janet. Sorry I missed your question the other day. Traditional Japanese single-beveled knives can be remarkable cutting tools. They tend to be very specialized, though, and not particularly well suited to western style cooking. If you cut a lot of sushi or break down whole fish, they're spectacular. Otherwise, their idiosyncracies make them less suited to life in a western kitchen. For example, the yanagiba (sushi knife) is designed to cut fish in a very specific way. If you don't cut that way, the difference between the beveled and unbeveled sides will cause the knife to twist in the cut, making it difficult to cut straight. If you want to experiment, however, and can buy a quality knife for a reasonable price, go for it. They're a lot of fun. And fairly easy to maintain. If you like the Japanese style handle but are more adapted to western style blades, a wa-gyuto would be a good choice. The gyuto is the Japanese version of a French chef's knife. They're thinner, lighter, harder and sharper than the Euro-centric knives most of us are used to. They come with western handles. The wa-gyuto comes with a traditional Japanese oval or octagon handle (wa meaning Japanese). 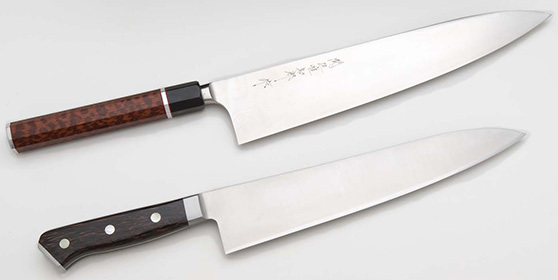 Good examples include the Suisin Inox wa-gyuto and the Hattori KF 270mm wa-gyuto. As for the Shun Elites -- yeah, go for it! It's great steel. The handles are a little chunky for my taste, but I'm so spoiled at this point that I'm probably not the best judge. Definitely make sure they fit your hands and that you have sufficient knuckle clearance on a cutting board. If they feel good to you, and you can get one for a good price, I'd say you'd be hard pressed to go wrong. I'm eager to hear what you end up with. Can you divulge some of the lower cost knives $100 or less that you like, or kept ? Or should I wait for the book to be delivered? That $100 range is the real breaking point between good and truly excellent. However, there is a good knife for every budget. You want at least an 8" chef's knife. First time buyers are sometimes intimidated by larger knives, but if your knife won't reach all the way across the pot roast dinner prep becomes a lot more difficult. Eight inches is the minimum, in my experience. For a $20-25 budget, there is the Forschner/Victorinox Fibrox-handled chef's knife. Unlike many stamped knives, this one comes with decent geometry and pretty good steel. It's a great starter knife or one to stock your beach/lake cabin so you don't have to take your expensive knives. I like them. Cook's Illustrated loves them. They're good knives. At the $50 price point, there are really only two that offer real performance, but both are excellent gateway drugs, uh, entry points into quality Japanese knives. Both the Tojiro DP gyuto and the Togiharu Molybdenum gyuto are reasonably priced. The Tojiro has an inner core of hard, high carbon steel jacketed with softer stainless. The Togiharu steel is a little softer (58Rc) but still capable of taking a more acute edge than most European-style knives. Right around $100 is where we can completely redefine the modern chef's knife. There are four knives that are readily available and better than just about any of the big name brands available today. If you're a fan of the chunkier, more upswept German style (Wusthof, Henckels, et al), the Messermeister Meridian Elite series comes with more comfortable handles, significantly better edges, and partial bolsters for ease of sharpening. Very nice knives. In between the Germans and the Japanese are the Shuns. They have a more pronounced "belly" to the blade, like the Germans, but are thinner, harder and use better steel, like the Japanese. The Shun Classic 8" chef's knife can be found for about $120. On the western-style Japanese side of the equation, with a flatter, more triangular profile very much like a traditional French chef's knife, are the Mac MTH80 8" Granton edge chef's knife and the Global G2 8" cook's knife. The Global handles are a love 'em or hate 'em affair, but if they fit your hands they're a lot of fun to use. Mac knives can be hard to find in brick 'n' mortar stores, but are worth seeking out online for reasons detailed in a previous response. I like them a lot. The Mac is the knife I almost always recommend when someone says they want to get into good knives but don't want to break the bank. These are all 8" knives. There are usually 240mm (9.4") and 270mm (10.6") versions of the Japanese knives and 10" versions of the Euro-styled knives available for a few dollars more. I've gravitated to 240mm and 270mm as the standards in my kitchen. You really can't go wrong with any of the knives listed here, so whatever your budget there is a high quality chef's knife out there for you. I should add that if you're not intimidated by ordering from Japan (and you shouldn't be; it's easy), JapaneseChefsKnife.com has the excellent Hiromoto Gingami #3 210mm gyuto for $112. If you don't mind the fuss of a straight carbon (non-stainless) knife, the Hiromoto Aogami Super 210mm gyuto and related knives have legions of rabid fans. The steel, also known as Blue Super, is one of the best around. You just have to be a little more attentive in your care of the knife. As long as we've got Shun on the table, what's the deal with their Wasabi line? Can you explain bead blasting in the context of making a blade? How does Daido 1K6 steel compare to say, the VG-10 in most of the other Shun lines? And finally, how can they be so cheap (the 210 mm Deba is $40 MSRP)? I ask because it seems like an inexpensive path to explore the single-bevel knives. Obviously not going back to the MAC website even though they treated me so well. Kristin, Mac has had a price increase recently. It surprised me, too. I feel bad because I listed street prices in the book, which are now inaccurate. The Mac website always reflects MSRP, i.e. "list price," so it's always going to be significantly higher than you can find the knives at other places. For example, the MTH80 that is my standard recommendation for people wanting to try high performance knives is now listed at $145 on the Mac website. You can find for $119 just about anywhere. That's the new street price. When I bought mine the street price was just under $90. Dave, I have to admit I don't know much about the Wasabi line. I assume the bead blasting will keep the knife from showing smudges and fingerprints but will probably increase drag slightly. That's just a guess, though. It mimics the traditional Kasumi "mist" found on higher end knives, where the upper portion of the blade is matte while the edge below the shinogi line is polished. The Daido 1K6 steel doesn't show up on any of my steel charts. There is also no information about it on the Kershaw/Kai/Shun website, which is odd because they have pages dedicated to the VG10 and SG2 used in their other lines. Luckily there is a good discussion about the Wasabi line and 1K6 steel from Knifeforums.com's "In the Kitchen" forum. From all accounts they make for good entry level or beater knives. According to one poster, who called the factory, they are hardened to 57-58 HRC, which is respectable. All in all they do look like an inexpensive introduction to single beveled knives. Here, in your book excerpt and posts I don't see much information actually useful for a cook who needs to select a knife. Disclosure: My financial and economic interests are in some original mathematics and some associated advanced computer software, and I have no financial or economic interest in knives or other products for food or cooking. My only interest here is general 'contribution to the quality of information in cooking and civilization'! "ahead, best, better, big, cheap, excellent, fine, garbage, good, great, hard, hardened, harder, high, low, optimal, quality, screaming, sharp, sharper, simple, super, superior, ubersteel, wondrous". "Vera Pure suddenly felt warm, unambiguous, compelling, autonomous tingling sensations totally new to her; could this be her long sought, highly coveted pinnacle of 'true passion' about which she had read on so many past, uninterrupted, indistinguishable, quiet, solitary, dark and lonely nights?". "very inexpensive and very light"
"all of those wondrous virtues you've read about"
"light weight, hard steel and screaming sharp edges"
"a high quality chef's knife"
"one of the best around"
and from these (and the context of each) I see no useful information because it is not at all clear what constitutes "best", "better", "excellent", "fine", "good", "great", "hard", "harder", "high", "inexpensive", "light", "optimal", "quality", "screaming", "sharp", "sharper", "superior", "ubersteel", or "wondrous". I have to doubt that you mean that "ubersteel" is from Alberich or Loge in R. Wagner's 'Der Ring des Nibelungen', maybe with "high-alloy" content of unobtanium, but you have not been more specific. In cooking we gave up saying that an oven was warm, hot, or "screaming" and adopted the practice of reporting temperature in degrees F or C. That's crucial progress in the rise of civilization out of superstition, witchcraft, and the depths of degradation! In particular, if a blade is "hard", then what would be meaningful would be to say how hard it as measured on one or several standard scales of hardness, e.g., Rockwell, and then for comparison to list the hardness of some other blades on the same scales with some indications of what sharpening means are effective at various values of hardness. In my experience, if we do not have some actual numerical measures, then usually even for a start we will have next to nothing. Similarly: If we are going to consider ability of a steel to take an edge or hold an edge, then we should have numerical measures. Similarly, to say that a knife is "light" or "heavy", we should have its weight and, for comparison, the weights candidate alternative knives. E.g., for the chef's knife, two for $15, blade length about 10", I described in my post #25, I just weighed one of the knives and got 6.6 ounces. From the Sabatier chef's knife I mentioned in that post, also with a blade length of about 10", the weight is 8.7 ounces. With more such examples we can get more information on what actually constitutes a "light" or "heavy" 10" chef's knife. "they are, in fact, made by punching a knife shape out of a flat sheet of steel and putting a simple edge on it." "Yup, they look like they were cut from sheet stock, have no bolsters, no rivets, and have white plastic handles." A. Dull edge of blade near handle -- 0.1009". B. Dull edge of blade half way from handle to tip -- 0.0823". C. Dull edge of blade about 1/4" from the tip -- 0.0394". D. Sharp edge of blade near handle -- 0.0286". E. Sharp edge of blade about half way from handle to tip -- 0.0208". F. Sharp edge of blade about 1/4" from tip -- 0.0166". where for the sharp edges the thickness was from the unsharpened part of the blade but still close to the edge. "out of a flat sheet of steel"? From my measurements, clearly not! That is, on the dull edge from the handle to the tip the thickness descends 0.1009", 0.0823", 0.0394"; on the sharp edge from the handle to the tip the thickness descends 0.0394", 0.0286", 0.0208", and clearly the thickness descends from the dull edge to the sharp edge. "Flat" (i.e., each side a plane and the two planes parallel) it's not! Ah, before concluding a flat sheet of steel, nothing like taking some numerical measurements! Do these thickness measurements mean that the blade was made by "stock removal" or "forging"? Maybe not: It may be possible to get this blade just by rolling flat sheet steel through cylindrical rollers that are closer together on one edge than on the other and, then, cutting the blades carefully selecting the orientation on the resulting sheet! Maybe! If so, then that would be a fourth manufacturing technique in addition to forging, stock removal, and cutting from flat sheets! I noticed your discussion of how sharp some knives were new from the factory, but I can't conclude that this is very meaningful because in use too soon such a knife will need sharpening so that after a few sharpenings the sharpness obtained at the factory will be only an example of how sharp it is possible to get the knife with special equipment and otherwise nearly irrelevant. Similarly for your mention of a "simple edge". "If you compare a $100 forged knife from the gourmet boutique to the stamped knife you picked up at the grocery store in an emergency, forged knives do come out way ahead." Now, I definitely prefer a "gourmet boutique" for the MUCH prettier sales clerks, about 5' 5", 115 pounds, 22" waist, very long blond or auburn hair, cute face, etc., even if they don't know which edge of the knife to use, but I still have to ask, for the knife, just the knife itself, "Way ahead" in what respect? "As I said before, if you compare a $100 forged knife with a cheap grocery store knife, the forged knife wins." "That $100 range is the real breaking point between good and truly excellent." "Good" and "truly excellent" in what respects? You have just unsubstantiated, qualitative remarks that can be taken as pejorative or laudatory personal opinions but otherwise nearly meaningless. You're not giving us solid, meaningful, supported, useful information. If you have some solid information -- hopefully numerical measures -- on some significant differences for some of these knives, then trot it out. I mentioned a 10" chef's knife, two for $15, and that is clearly MUCH less than your $100 or so. Since what I mentioned was really $7.50 per knife and from Sam's Club, essentially a "grocery store", sounds like I got a "cheapo" knife. Yet, I can find nothing seriously wrong with it: For the metal "quality", as far as I can tell, it takes an edge and holds it just the same as the carbon steel Sabatier I mentioned. Of course, I don't have the hardness on the Rockwell or other scales of the $7.50 knife, the Sabatier, the Henckels and Wustof knives I looked at before I gave up on $200 knives, or most of the knives in your posts, and without such figures about the best any of us can do on metal "quality" is just to sharpen a knife, see how sharp it appears to be, use it, and see how well it seems to hold an edge. Somewhere in my collected papers I may have signed last statements from pounds and pounds of onions, carrots, celery, tomatoes, BBQed picnic pork shoulder, corned beef, oranges, grapefruit, lemons, etc. saying that the knife is quite sharp. Sure: For some additional solid information, I'm willing to get it; I'm wanting to get it; I'm waiting to get it. But I ain't got it yet. Then, so far I'm left with a lot of meaningless adjectives -- maybe I'll send them to Vera Pure or her editor for their next efforts in romance novels -- and otherwise essentially no useful information that you have found a 10" chef's knife better in any significant sense than the $7.50 item I mentioned. Net, from your posts, I am getting essentially no useful information on knife selection beyond what I picked up two for $15. Hey, guys: Looks like you can get a 10", stainless steel chef's knife as useful as any for $7.50 each! "Why pay more?". Why read the book? Why buy the book? Save your time, money, and effort! Save some trees! Hooray for the Internet and eG! Now, someone, please, write a book on kitchen knives that lets me get a genuinely more effective chef's knife than I already have for $7.50. "More effective" how? E.g. with appropriate sharpening tools, takes a sharper edge and holds it longer, and where the metal hardness is documented, appropriate sharpening tools are listed, and we have some meaningful numerical measurements on how sharp we can get an edge and how long it lasts. Now I realize that Vera Pure's favorite romance novel editor might not think this way, but such thinking is MUCH easier for someone making mirepoix out of two pounds of each of carrots, celery, yellow globe onions, and leeks! I'm very sorry you feel I have nothing to contribute. I'm also very surprised that someone of your scientific bent would infer from a 3,000 word excerpt that a 70,000 word book is of no value. I do, of course, express my opinion. I also back up each and every assertion with hard facts and science. Perhaps not to the depth that you would like, but one must strike a balance between making a point and beating that point into the ground and boring the general public. Of course, having not read the book, you are in no position to determine whether I provide sufficient basis for my "romance novel" claims or not. Tell you what. I won't even ask you to buy the book. Send me your address and I will send you one of my author's copies. If you find it of no value, please send it back. "Net, from your posts, ...."
I'm not judging the whole book. I do have a sore spot -- "sore" as in RAW and TORQUED -- about books on cooking that look like they were written for readers of romance novels and edited by editors of romance novels and that lack solid, technical information crucial to actual use in the real world and not just to romantic novel fantasy. I don't know that your book is close to the romance novel crowd, but I have plenty of examples of books in cooking from other authors. As I illustrated, your posts in this thread here on eG -- including your sample from your book -- are long on adjectives and qualitative remarks (that I conclude don't mean much to someone selecting a real knife for real work in a real kitchen) and short on numerical measures that would be meaningful; so, your posts here and your book excerpt, assuming that you have representative samples, make your book look like it is for the qualitative, adjective, fantasy, fiction crowd and not for the quantitative, technical, practical, real world crowd. As I mentioned in my first post in this thread, a big reason I gave up on Wustof and Henckels is that they wouldn't give me solid, detailed information on metal hardness, appropriate sharpening tools, practical edge angles, or ability to take an edge or hold an edge. As I mentioned, they seem to want to sell their knives just as wedding gifts, and only a TINY fraction of brides will care about metal hardness, edge angles, or steel, stone, tungsten carbide, ceramic, or diamond sharpening tools and appropriate jigs for them. I DO CARE! Since my $7.50 knife seems to have nothing seriously wrong with it and since Wustof and Henckels won't tell me why their knives are better, I'll stay with $7.50 and save the money. For me, people selling chef's knives for more than $7.50 each will have to get solid, technical, and quantitative on just why their products are better, or I'm going to call their stuff good for wedding gifts only and not for my use in my kitchen. If they have some solid reasons their products are better, then they should trot out those reasons. If they don't trot out such reasons, then I have to assume that they have no such reasons. "It's 'wondrous', but you wouldn't want to know why" won't get my time, effort, or money. I got your attention; I hope MUCH more to get the attention of your editor and publisher. Maybe I'll also get the attention of Wustof and Henckels: "Listen up, guys: As it stands today, a world-class, 10", French chef's knife is worth, retail, tops, quantity two, $7.50 each. If you want to charge more, then you MUST give some solid reasons why your product is better. I know; I know; you sell your knives in a fancy wooden box that costs more than $7.50; sadly, when I tried to use your box to slice a tomato, all I got was a big mess. I didn't think it was going to work, but with your reputation I gave that beautiful box every chance I could!" Another big pet peeve: From doing Google searches starting with this thread, I saw lots of knives for sale. I never once saw any information sufficient even to get me to consider a purchase. E.g., for product pictures, all I ever saw were tiny, gratuitous, uninformative, nearly useless photographs that looked like they were 'optimized' for transmission at about 15 characters per second. Can't see the product: Even if grab the GIF or JPG file and magnify it in, say, Microsoft PhotoDraw, once get some reasonable size, say, 1000 x 1000 pixels, the picture just gets fuzzy. The photographs are just TOO DARNED SMALL to have useful information. Not once did I see dimensions of the knife that would let me estimate the room for my knuckles. Heck, their pictures would have been MUCH more useful if they had simply included a grade school plastic ruler as an indication of scale. Yup: Selling to people who don't care what the size of the knife is. Right: Sell to that collection of people ready to spend over $100 on a knife and don't care what they are getting. Got a list of those people? Hmm ...! I think I can get a gross margin of 92.5%! Knife makers and retailers, listen up: You're not even TRYING to sell your stuff. Thanks for your offer, but let's compromise and save on effort and postage: Say where I went wrong on the $7.50 knife I mentioned. Or, and especially if you have not seen that knife, just say where I MIGHT have gone wrong realizing that it's in the style of a French chef's knife, has a 10" blade, is stainless, is not cut from a flat sheet and has the blade thicknesses I got and reported from my Dad's 70 year old micrometer, and seems to take and hold an edge as well as my Sabatier carbon steel knife. Where even COULD I have gone wrong? Or, where, in solid respects, even COULD a $100 or $200 10" stainless steel chef's knife be significantly better? E.g., my 10" carbon steel Sabatier that I bought decades ago is not really better in any significant sense that I can see, and today such a knife might cost over $100. Yup, my $7.50 knife has a white plastic handle: Since that handle works fine, I regard it as a feature, not a flaw. I don't conclude that a handle of black plastic attached with chrome plated, solid brass rivets or a handle of rosewood is better. I just used my $7.50 knife: I buy eggs in shrink wrapped packages of 36, USDA Grade A Large. I just made an omelet of six eggs and 2 T of butter. Yup, in a skillet about 10" in diameter -- maybe someday I'll write on eG just how to do that. Started with a new package of eggs. Once I open a package, I like to repackage the eggs in 1 gallon freezer bags, and for this I have to cut the egg cartons. So, I used my $7.50 knife. It worked fine. The thin blade helped me be sure not to slice or crush a raw egg! To me, I have good news: I've got for $7.50 what is apparently about the best 10" chef's knife on the planet, good enough that it's harder than pulling wild bull elephant teeth to get meaningful information that there is something better. So, my frustration is not the usually difficult one of getting a good product at a good price (I've already got two!) but just reading about products that are "wondrous" with no meaningful indication of WHY they are better. "3000 words"? Heck, just on this thread, just trying to get some solid information on where I went wrong for $7.50, I've already written 4455 words! This is not a debate, and I have no interest in turning it into one. I'm happy that you enjoy your Tramontina knives. There are people perfectly content to drive to work in a Yugo. I understand that you want in-depth specifics on the mechanical, metallurgical and physical properties of kitchen knives. The general public doesn't. If I were to start discussing isothermal transfer curves, carbide distribution in martensitic stainless steel or the trigonometry of sharpening, people's eyes would glaze over immediately. I wouldn't blame them a bit. That's why I wrote the book -- so that people looking to: A) make smart buying decisions about kitchen knives; B) learn basic knife skills; and C) learn to sharpen their knives, would have a place to turn that gives them the ability to do all of those things with confidence. All of the scientific background is in the book, but it is not a textbook, which is exactly why it succeeds (to the extent that it does). However, let's take a look at your Tramontinas. Perhaps they can serve as a springboard to understanding why some knives work better than others. If you like the plastic NSF handles, great! Handles are one of the most overlooked aspects of a good knife. The most expensive knife in the block won't do you much good if it is uncomfortable to use. My tastes have evolved so that I now prefer the simplest handles possible, either traditional Japanese oval or octagon handles or slim, French Nogent style handles. "Ergonomic" handles that force your hand into a single position are uncomfortable to use over time because you can't shift your grip. The steel in those Tramontina knives is most likely 1.4021 (AISI 420), the most common steel used in that type of cutlery, according to the European Stainless Steel Development Association. That steel contains .15 to .3 percent carbon and 12 to 14 percent chromium. The low carbon content means that it can only be hardened to about 54 on the Rockwell C scale (HRC). I doubt if it is that high. When you add heavy carbide formers like chromium you need better than .8 percent carbon to reach full hardness. The chromium locks up carbon, keeping it from hardening with the iron matrix. Your knives are probably in the 48-52HRC range. Tests done by knife maker Wayne Goddard and heat treatment guru Paul Bos show up to a 20 percent decrease in edge holding for each two point drop in Rockwell hardness. In my experience 58-62HRC is the ideal range for kitchen knives. For reference, Wusthof lists their knives at 56HRC. On the plus side, the steel will be very wear resistant and stain resistant. It will also be very tough, i.e. resistant to chipping. It will bend rather than break. On the minus side, steel that soft will not take or hold a high performance edge. Because the edge of the soft steel is prone to rolling, manufacturers put a thick edge on their knives -- usually 22 to 25 degrees per side for an included angle of 44 to 50 degrees. That creates a thick wedge that splits food rather than cutting it. Ideally, the blade should taper to about .02"/.5mm measured a quarter of an inch behind the cutting edge, a measurement first put forth by John Juranitch's "Razor Edge Book of Sharpening" and, if I remember correctly, confirmed by John Verhoeven in his Experiments in Knife Sharpening 2004, an excellent read, by the way. Dr. Verhoeven is Distinguished Emeritus Professor of Materials Science and Engineering at Iowa State. His book, "The Fundamentals of Physical Metallurgy is the standard text on the subject. While the edges of the Tramontinas (and most European-style knives) can be taken down to more acute angles, preferably with a back bevel to thin the steel behind the edge, they can't be taken down as far as a harder steel. That is one of the advantages of modern alloys, which I humorously (I thought) refered to as übersteels. They can be sharpened to angles that would cause a softer steel to roll almost immediately. The next problem with soft steel is it's inability to hold a polished edge. Sharpening, by its very nature, creates a pattern of scratches on the edge of the knife. In general, you want the smoothest, most polished edge you can achieve. A toothier edge has its place outdoors -- cutting rope, for example -- but in the kitchen a more refined edge cuts better and lasts longer. It's simple physics. Force equals pressure over area. A knife edge a thousandth of an inch thick with one pound of pressure behind it concentrates 1,000 pounds of pressure per square inch at the edge. A rough, microserrated edge is like a series of points. Each of those points is under tremendous pressure and wears or rolls as you cut. That's a formula for edge failure. The more polished the edge, the more you move away from microserrations and toward a continuous edge (or at least a greater number of smaller points). Each point is now under less pressure. ABS Mastersmith Bob Kramer offered the analogy of lying on a bed of nails. Ten nails will really hurt. Distribute your weight over a thousand nails, however, and you can lie comfortably. Professional sharpeners who routinely sharpen hard Japanese and Swedish steels to 8,000 or even 16,000 grit (about 1 micron particle size) won't take a softer steel over 1,000 (15 micron particle size or 600 US sandpaper grit). It's not worth the effort. So low-carbon steel leads to a comparatively coarser, softer edge that doesn't cut as well or last as long as a harder, more acute edge. If someone is happy with a Tramontina, Dexter Russell or the Victorinox I recommend in that price range, that's great. There is nothing wrong with that. We each have our priorities. It would be a mistake, however, to assume that because one person is satisfied with that level of performance that others should be as well. Can you tell us what most surprised you in your research for this book? What one thing or perhaps a number of things set you back on your heels proclaiming, "WOW I didn't know that!" or "WOW who knew this knife was that good!" Anna N (who hides her electric sharpener under a dish towel!). I wanted to send you a BIG THANKS for all your work and contributions to eG. My husband is using that sharpener you recommend (the wierd manual one from Oregon) and my knives are AMAZING now. We have had Henkles for years now and he has previously used the electric Chef Choice sharpener. It didn't do near as much for the blade as the manual one does. He controls the angle of the cutting surface and has double beveled the edge on a couple for me to try out as well. He's also softened the (?) spine of the knife for me so the grip is more comfortable. What a difference! I compared cutting lime halves, onions, tomatoes, carrots all between the old blade and the new and the new runs through the produce like it is nothing. I have to work so much less to get the job done and that is a real tangible benefit. So the issue is still my thumb - could you explain to me again the whole technique of dragging your curled fingers towards that tucked in thumb - it's just not quite clear in my mind?